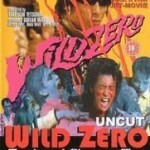 Wild Zero—oh, yes, some stunning zombies in that humorous horror cult classic directed by Tetsuro Takeuchi. Garage punk artists, aliens, motorcycles, guns, crazy hair, love-hungry gals and the fresh-from-the-grave-voracious undead. Yes, I am a sucker for Japanese horror films.